I can't live without Disney Family.com! If you know me, you know that I love a themed event and I will try to find any reason to host a themed party. I use Family.com for all my children's birthday parties, Easter, Halloween, Thanksgiving and of course Christmas. I have been using Family.com for a few years now to help me plan the perfect party or bring a smile to my kid's faces with a unique treat and over the years I have made some pretty cool things. I wanted to share some of my favorite recipes with you and luckily, I took pictures of everything I have ever made from Family.com. Last year for Easter my son's preschool class was having a potluck and I couldn't wait to show up with my Easter Chicks! They were a huge hit! His class also had a potluck for Halloween so I made these creepy eye ball cookies! For Thanksgiving my centerpiece was a Turkey made of fruit & cheese! Then for dessert we ate Pilgrim Hat cookies. I also get a lot of amazing crafts ideas and fun printables from Family.com. This Thanksgiving I sat down with my kids and we made the cutest Turkey hats I've ever seen! The best part was that we traced our hands, cut them out and used them as the turkey's wings! -Construction paper, kid safe scissors, glue stick & wiggly eyes! I am all set for Christmas thanks to Family.com! 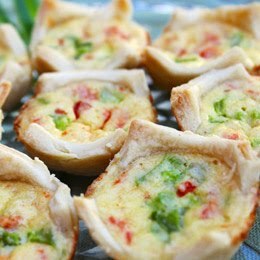 I found a great recipe for the most festive Red & Green Quiche Bites. They are the perfect starter for a Holiday dinner. Family.com is the best site to visit for themed decorations and printable activities too. I try to incorporate Mickey and all of his friends into our Thanksgiving and Christmas gatherings and no tree would be complete without Disney Ornaments. 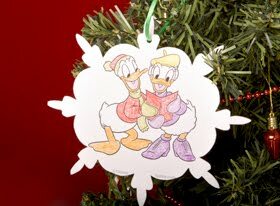 I love this Disney Mickey & Friends Color-In Snowflake ornament that the kids can color and hang themselves. I can't wait to see them on the tree with all of our other Disney decor. There are a bunch of different ornaments and tree toppers that are just a click away. We always hang candy canes on our tree and munch on them throughout the 25 days leading up to Christmas. 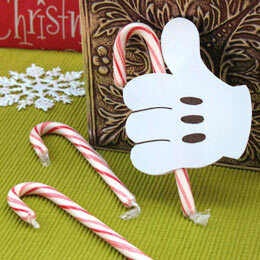 How adorable is this Mickey's Handy Candy Ornament? It will surely make our tree the most super duper Disney tree this year! We are HUGE fans of Disney's Prep & Landing so when I saw these cookies I went absolutely bonkers! 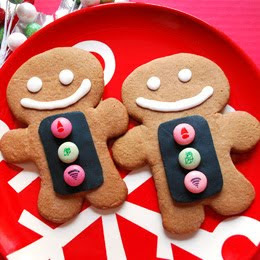 How CUTE are these gingerbread cookies? If you know anything about Prep & Landing then you know that the elves use a Gingerbread Man Scanner on Christmas Eve. These cookies are made to look exactly like the scanners used by Wayne and Lanny. 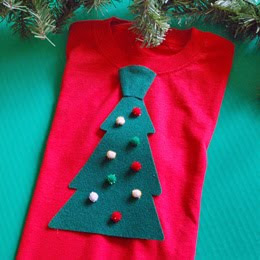 My husband always refuses to wear any form of Holiday gear, but this year he will have no choice because I am making Wayne's Celebration Tie for him out of felt and pinning it to his favorite tee. What I love the most about Disney Family.com is that you don't have to be a Master Chef or Crafty Guru to enjoy the ideas on this site. There is literally something for everyone. Nothing is more important to me than quality family time and Family.com offers a wide variety of fun for everyone in your family to enjoy. Visit Family.com now and start planning your Holiday Celebration!